Published twice a year, the Netherlands Architecture Institute's Architecture Bulletin presents essays about the designed environment of today, tomorrow and yesterday. 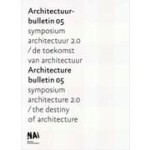 The Destiny of Architecture is the theme of Architecture Bulletin 05. 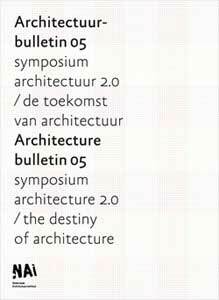 During the ‘Architecture 2.0’ symposium in Rotterdam, six prominent Dutch architects and four talented youngsters presented their views about contemporary architecture, the role of the architect and the future of architecture. These reflections and outlooks are compiled and illustrated in Architecture Bulletin 05, together with an introductory essay by Ole Bouman, Director of the Netherlands Architecture Institute. For anyone who attended the symposium, this publication offers a wonderful overview of the topics that have been presented. For everyone else, it is precisely these portraits that will enthral. Together they create an impression of the Dutch talent that is currently causing such an international furore. With texts by Wiel Arets, Ben van Berkel, Ole Bouman, Mels Crouwel, Jochem Heijmans, Francine Houben, Marten de Jong, Sander Lap, Winy Maas, Willem Jan Neutelings, Ivo Opstelten and Ronald Rietveld.